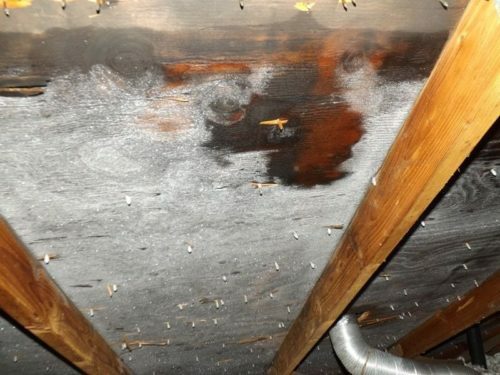 attic ventilation Archives - Charles Buell Inspections Inc.
Is your insulation doing what you think it is doing? 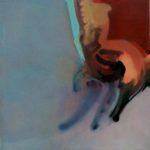 I do not want to tackle the huge ugly topic of whether fiberglass insulation should be used at all–as it frequently is in attics. For today, I just want to talk about one obvious issue with fiberglass insulation that prevents it from performing as expected. The short version of what is wrong with fiberglass insulation is that it is not an air barrier, therefor, if it is not encapsulated and air sealed on all six sides its performance suffers. In an attic, at most, only five sides is likely to be sealed leaving the entire top not sealed. This post is about the sides, which can and must be air sealed. The vented sides are typically not adequately air sealed, especially along the eaves. Insulation baffles, designed to keep insulation out of the lower roof venting and to allow for air flow into the attic, rarely gets adequately sealed. 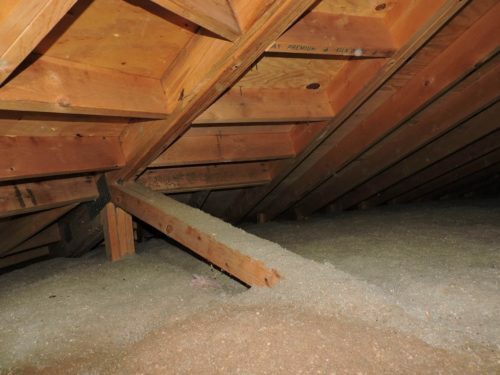 Because the baffle/top plate connection is not air sealed, and because fiberglass insulation represents very little resistance to air flow, air pushes its way into the attic right through the insulation. As it does this, it either cools the ceiling in the area, or warms the ceiling in the area depending on the season and/or side of the house. In the winter and/or the north side of the home, the air will tend to make the ceiling cooler in the area of the vent. 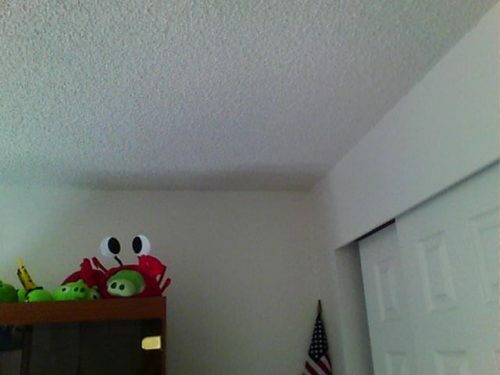 In the summer, especially on the sun side, the air will tend to warm the ceiling in the area of the vent. This will increase both heating and cooling loads of the home. 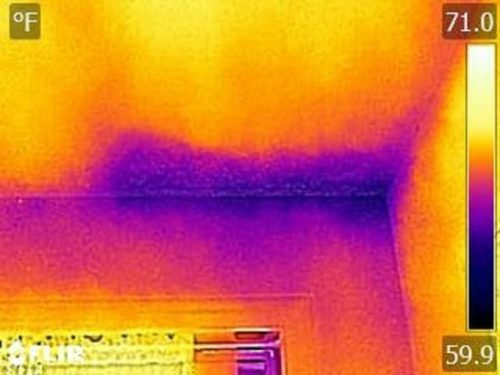 This next picture shows what that area looks like at the interior ceiling with Infrared camera on the South side of the home. Warm air is moving through the insulation and warming the ceiling. 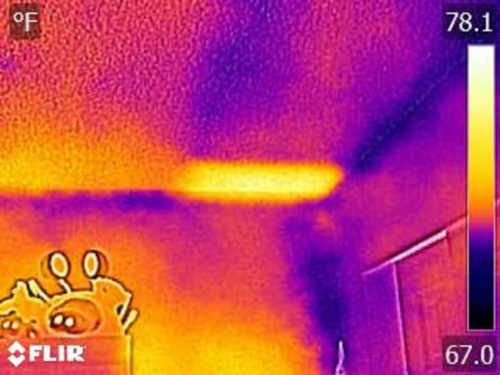 In the same house on the North side we can see how the ceiling area near the vent, as indicated by infrared camera, is “cooler.” In the actual picture we can see the fungal growth present because this vent happens to be in the area of the bathroom. 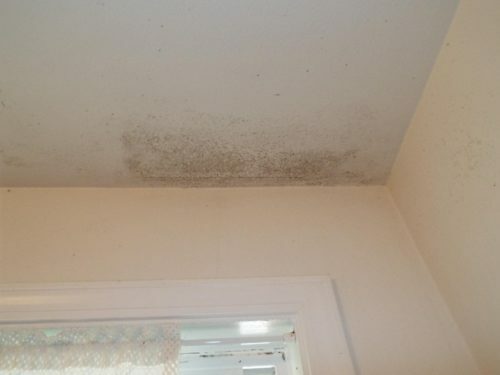 The moisture in the bathroom condenses on the cooler surface creating a perfect environment for mold growth. The only real repair for this condition is to pull back the insulation and properly air seal the gaps where the insulation baffle and the house framing meet. Spray foams are good for sealing the areas where the baffle makes contact with the framing as indicated in the circle in the picture above. 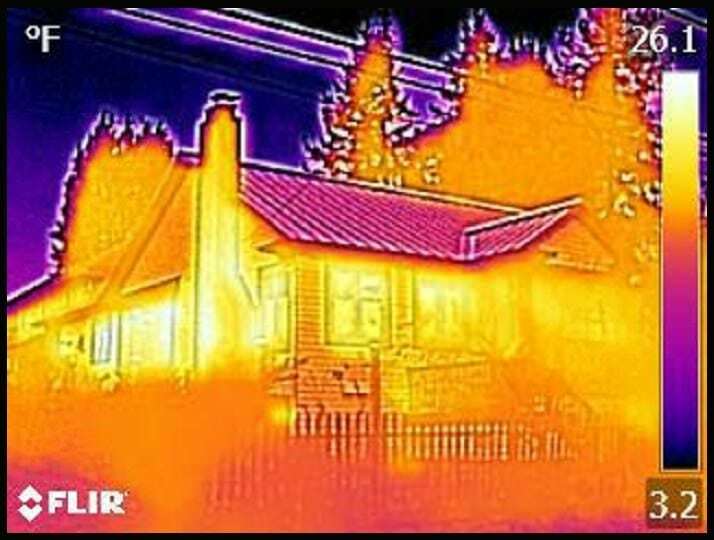 Of course, in a perfect world, we would not use fiberglass insulation at all, and instead use types of insulation that are much better at stopping the flow of air. Cellulose fiber insulation can do a much better job at this. 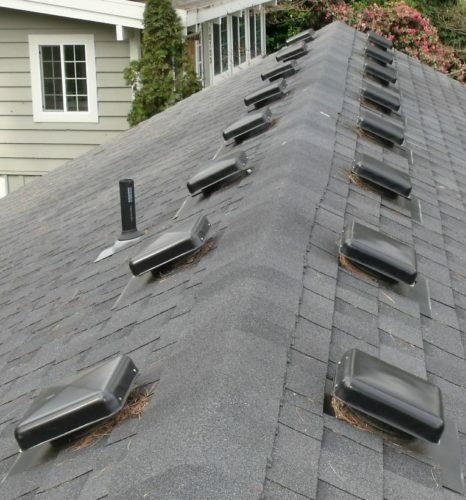 Many people seem to think that ventilation is the answer to all moisture issues in the attic. The reality is that adequate ventilation–proper ventilation–will only deal with “normal” moisture conditions that the attic space is subjected to (in most cases). Another way of stating this is that the best ventilation in the world will not deal with moisture condensing out of an inordinate amount of warm moist air finding its way into the attic. A while back, I inspected a home with ideal ventilation and yet it still had one of the worst condensation issues I have seen for some time. For our discussion here, we are going to assume the roof does not leak. 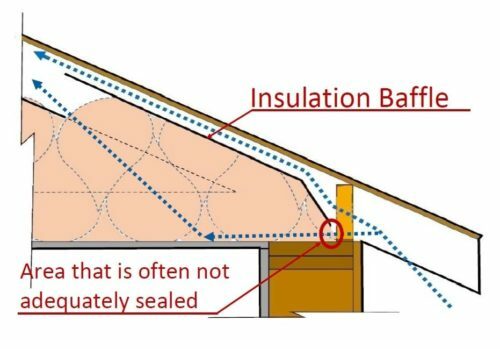 At least as important as ventilation, if not more important, is having a proper air barrier between the living space and the attic/roof structure. If this air barrier is not continuous, moisture that is in the warm air that finds its way into the attic space, can, and will, condense on the cold surfaces it contacts–if that surface is cold enough. If these surfaces are below freezing then it will show up as frost. Obviously many of these cannot be determined in the course of a standard home inspection because of access and/or insulation. Repairs can be easy or difficult depending on how obvious the by-passes are. In the case of this house there were a few obvious things that should be addressed prior to removal of all the insulation. 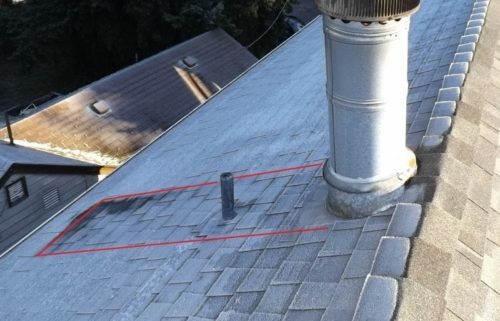 From the roof, thanks to the frost, one can see where there is less frost in one area and no snow in a large area that corresponds to the shape of the chimney chase at the interior of the home. 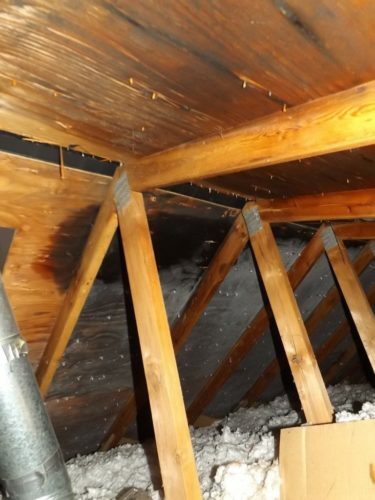 It does not take a rocket scientist to guess that the connection of the chase with the attic is not adequately sealed. Of course lifestyle can be a factor. If the occupants don’t use exhaust fans when showering or the fans are not functional we can expect to have higher humidity inside the home–which can then find its way into the roof structure. 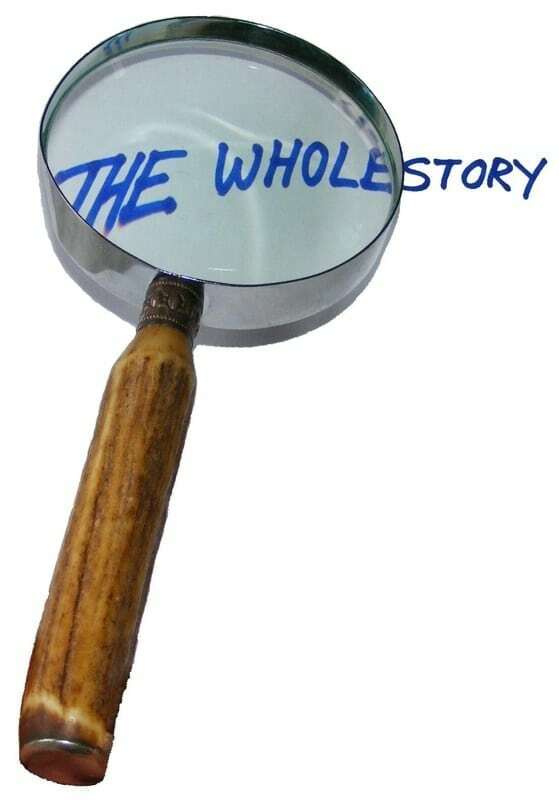 But there was another big hint as to another possible source of moisture to the indoor environment–the crawl space. At many locations around the home there was evidence of poor air sealing at wall floor connections consistent with air infiltrating/exfiltrating from the crawl space. 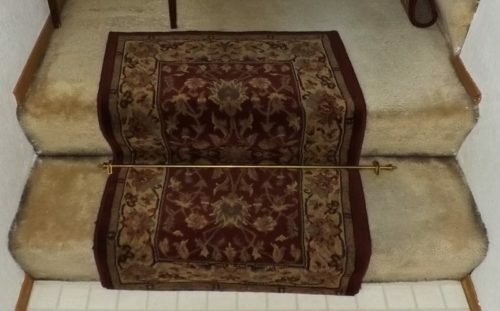 It was particularly evident at the steps from the entryway up to the main floor level as can be seen with the “ghosting” in the following picture. A LOT of air is coming and going at these black areas and the carpet is a pretty good filter. If the crawl space is “cold” and at high humidity and that air is drawn indoors where it is then warmed by air at high humidity the indoor air becomes even more humid. 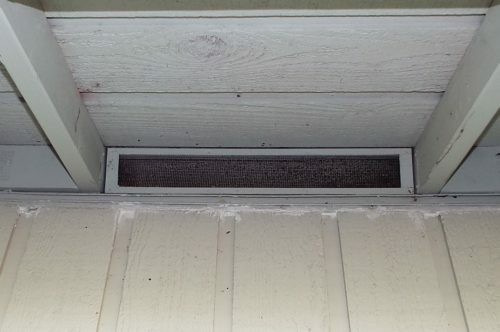 Stack effect works to continually pull air from the crawl space through the living space and on into the attic space. 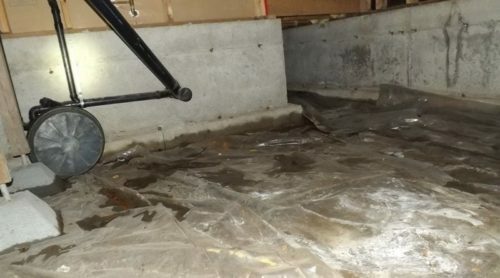 The crawl space was flooded in some areas and showed a history of being flooded–worse than when I was there. So now we have an attic moisture issue that is only likely to be fixed when the house drainage system is fixed–along with all the other by-pass issues we discussed. Some people think that if they add a POWER vent they will surely move enough air out of the attic. But really this only serves to put the attic under even greater negative pressure thereby increasing the draw of moist warm air from the home. More attic ventilation is not going to help.